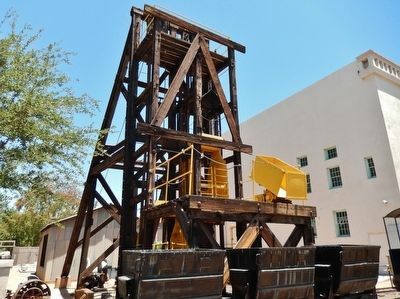 The Boras Headframe was the last of the wooden headframes built in the Warren Mining District near Bisbee, Arizona. Erected in 1917, it hoisted over 50,000 tons of copper ores by 1926 when the mine was closed during the Depression. Production resumed in 1938 and continued to 1944. In 1952 the headframe was reconditioned and some of its wood supports were replaced with steel. Until 1975 it served as a ventilation and escape shaft for the interconnecting underground workings of the Dallas and Cole mines. The relocation to Phoenix was completed in 1998. 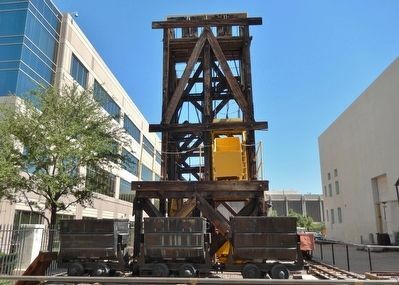 The shaft served by the Boras Headframe was 1,034 feet deep. The hoist's motor was manufactured by General Electric and rated at 52 horsepower at 550 rpm. Maximum speed of the hoist was 1,200 feet per minute. The Arizona Heritage Fund and Phelps Dodge Corporation, Inc. provided restoration funding. Thanks to many organizations who provided labor and materials for the project. Special thanks to Arizona Public Service Company for the use of their crane and its crew. Donated by Phelps Dodge Morenci, Inc.
33° 26.9′ N, 112° 5.537′ W. Marker is in Phoenix, Arizona, in Maricopa County. Marker is on West Washington Street 0.1 miles west of 15th Avenue, on the right when traveling west. Touch for map. The marker is adjacent to the referenced structure, inside a fenced courtyard. The courtyard belongs to the Arizona Historical Society's Polly Rosenbaum Building, formerly the El Zaribah Shrine Auditorium. Marker is at or near this postal address: 1502 West Washington Street, Phoenix AZ 85007, United States of America. Touch for directions. Other nearby markers. At least 8 other markers are within walking distance of this marker. Arizona Copper Company's Locomotive #2 (here, next to this marker); Arizona's U.S.S. Arizona Memorial - In Memory of the Gallant Men (about 300 feet away, measured in a direct line); Arizona World War II Memorial (about 400 feet away); U.S.S. Arizona Signal Mast (about 500 feet away); The Arizona Korean War Veterans Memorial (about 500 feet away); Father Albert Braun O.F.M. (about 600 feet away); Jacob Waltz (about 600 feet away); Jewish War Veterans Memorial (about 700 feet away). Touch for a list and map of all markers in Phoenix. Also see . . . Boras Shaft. More. 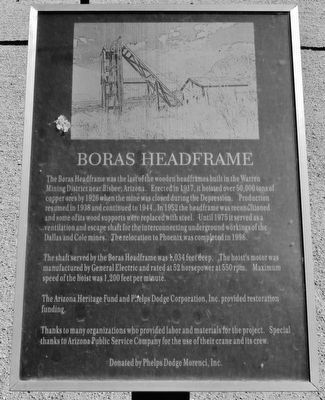 Search the internet for Boras Headframe. Credits. This page was last revised on July 26, 2018. This page originally submitted on April 12, 2016, by Cosmos Mariner of Cape Canaveral, Florida. This page has been viewed 231 times since then and 6 times this year. Photos: 1, 2, 3. submitted on April 12, 2016, by Cosmos Mariner of Cape Canaveral, Florida. • Syd Whittle was the editor who published this page.